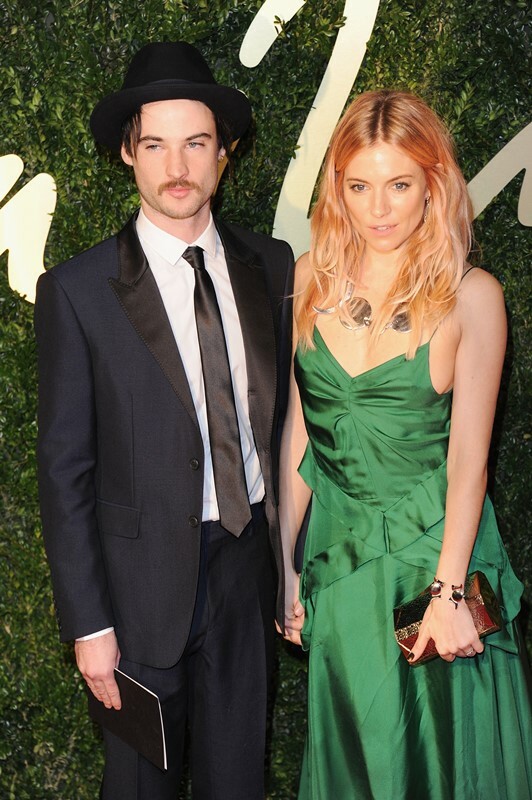 Check out this photo of Sienna Miller and Tom Sturridge at the British Fashion Awards last night. It’s cracking me up. She’s dropping some mega Ebola Hilton and he looks totally stunned. I’m sure the cameras just caught an awkward moment but the reason it’s so funny is because that’s just not Sienna’s usual vibe. She also doesn’t usually look so sh-tty in Burberry. I hate this dress. It’s messy. It’s cheap. (Even though it’s not cheap.) It’s only redeeming quality is that it’s green. But when green is done badly it can be embarrassing. Here’s a dress that actually belongs on Ebola Hilton. On the plus side, you’ll note, Sienna’s hair is now streaked pink. We’ve seen several celebrities try the pink. And to me, she’s done it best. Sometimes it just looks like it’s catching the light.